Former Belgium residence Adeline Schmitz passed away Monday morning, June 13, 2016 at Harbour Village in Greendale, her home of the past six years. She was 91 years old. Adeline was a native of the town of Belgium, born on October 30, 1924 to John and Clara Mayer Miller. She married Roman N. Schmitz of the town of Belgium, the son of Andrew and Mary Leider Schmitz, on April 18, 1951 at Holy Cross Catholic Church. Mrs. Schmitz, a homemaker, lived in Belgium for 68 years. She was a member of the Christian Mothers. She worked for 7 years at Allen Edmonds shoe factory in Belgium. 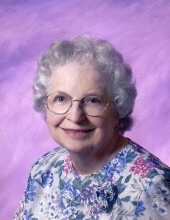 She enjoyed baking, working with flowers, camping, going to family Brewer game outings, puzzles, and listening to country and western music. Recently, she likes watching Dancing With The Stars. Mrs. Schmitz is survived by her children: Wayne (Joyce) Schmitz of Trinity, FL, Brian Schmitz of Franklin, Bruce Schmitz of Phoenix, AZ, and Joann (Scott) Lawton of Wittenberg. She is further survived by 5 grandchildren: Rachel Ann Payne of Glendale, AZ, John Samson Payne of Phoenix, AZ Jacob Curtis Payne of Gilbert, AZ Gina Lawton of Menomonie, WI and Stacy Schmitz of Trinity, FL great-grandchildren Samuel Dominic Payne and Jocelyn Rae Payne, other extended relatives and friends. She was preceded in death by her parents, husband Roman (5/31/1997), daughter Darlene Payne (11/16/2015), infant sister Virginia (4/6/1920) and sister Bernice Miller (4/9/2010). Her selfless and generous spirit will be deeply missed by her family, friends and those who knew her. Mass of Christian Burial will be held at 12 noon on Friday, June 17, Divine Savior Parish, Holy Cross Chapel, 5332 Hwy B, Town of Belgium. The family will receive visitors at the CHURCH on Friday from 11AM until services at 12PM. Adeline will be laid to rest beside Roman at St. Mary’s Catholic Cemetery in Lake Church later that day. The Eernisse Funeral Home, Belgium is honored to be assisting the family with arrangements. Online condolences may be left at www.eernissefuneralhome.com. To send flowers or a remembrance gift to the family of Adeline J. Schmitz, please visit our Tribute Store. "Email Address" would like to share the life celebration of Adeline J. Schmitz. Click on the "link" to go to share a favorite memory or leave a condolence message for the family.